PIPE PIER® pipe support systems are the most innovative support solution for roof and raised floor applications. The pipe supports are engineered to securely hold pipe, conduit, cable, and HVAC equipment. PIPE PIER® supports are made of a tough, flexible, roof-friendly closed-cell polyethylene foam that is UV resistant and practically weatherproof. The foam's firmness, with a gentle touch, protects expensive roof membranes even when there is no protective gravel or rock. Builders, contractors and engineers agree that PIPE PIER® supports are well constructed, durable, quick and easy to install, versatile, and cost effective. 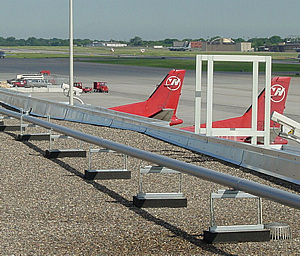 Read about the Advantages of PIPE PIER®. Ongoing, long-term testing has been conducted at the Atlas Weathering Services Group in Arizona. All results confirm the structural integrity of the PIPE PIER® Systems, even in the most hostile environments. PIPE PIER® supports meet the standards of the American Society for Testing and Materials (ASTM), and mechanical testing ensures the strength of each PIPE PIER® component. See more PIPE PIER® Testing and Certification.